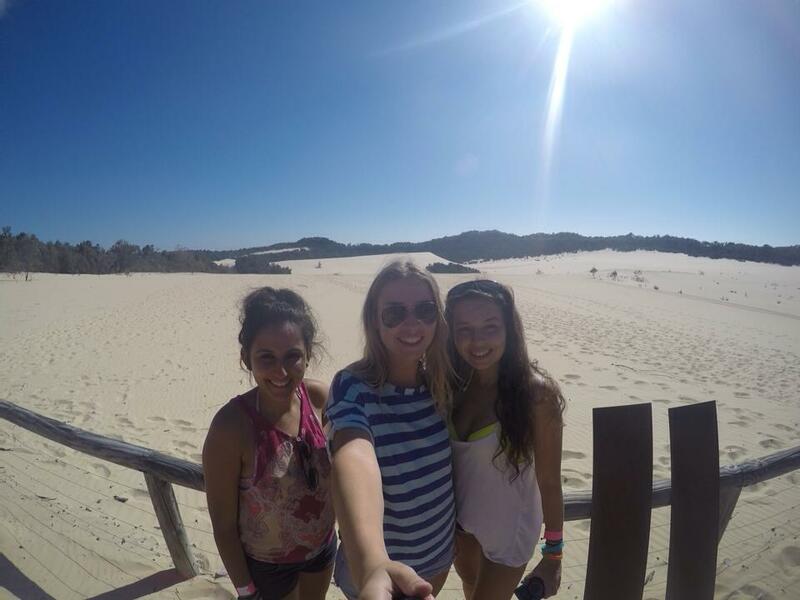 Mid Semester break on Fraser Island! 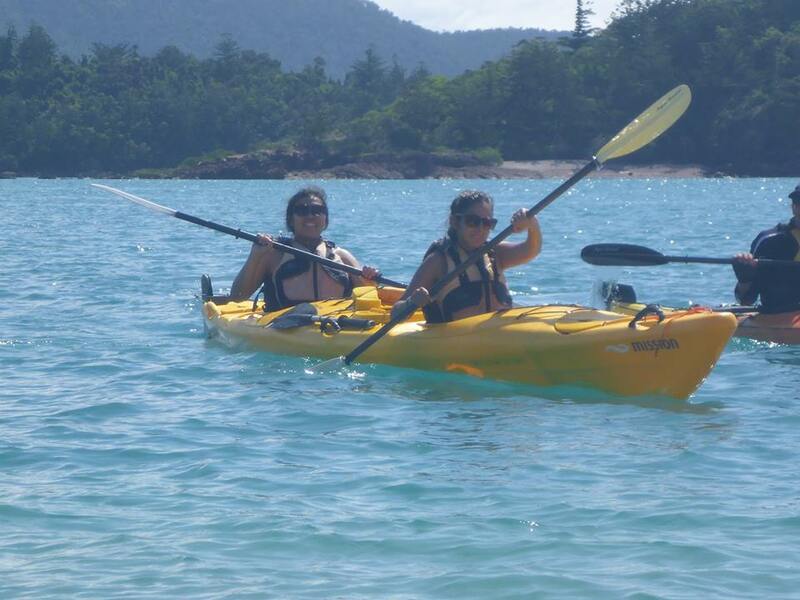 Over the Mid-Semester break I was lucky enough to go to Fraser Island with my friends, Sophie and David. Fraser Island is the World’s Largest Sand Dune. The island is a massive collection of sand that gets dragged in by the Pacific Ocean currents and stretches about 120 km long but only about 24 kms wide. Fraser is a World Heritage site so there are no roads, only sand tracks that can be accessed by 4WD. Whilst we were on Fraser our tour guide told us that if the island did not exist, all the sand that gathers there would have traveled further North and completely covered the Great Barrier Reef, meaning that we might not know about it’s existence. Next week I return to University for my second semester at UQ after a 3 month Summer holiday. As this marks the halfway point of my study abroad experience I think that now is a good time to reflect on the Academic differences between the University of Queensland and the University of Manchester. Surfers Paradise – Surfers Paradise is the main attraction of the Gold Coast region in Australia, just below Brisbane and once again easily accessible by public transport. It is known for its high skyscrapers, vast expanse of beaches and surfing! Sydney – After a grueling 12 hour overnight coach journey from Byron Bay to Sydney, we finally arrived in the most famous city in Australia. 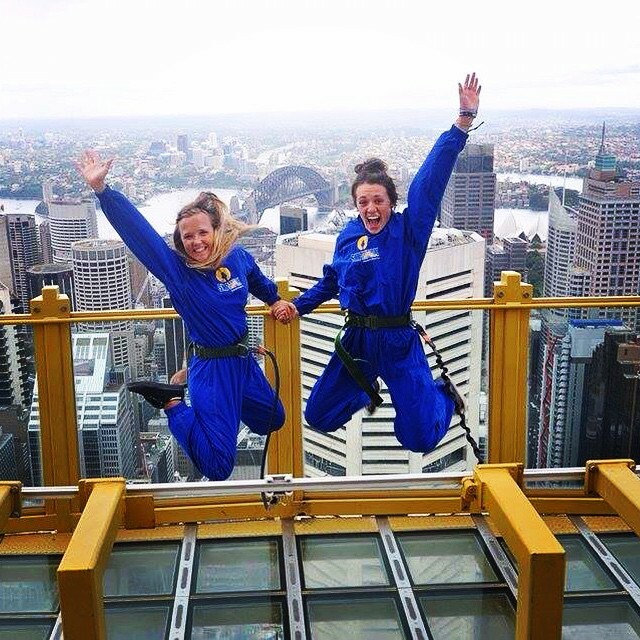 We stayed in the Kings Cross area of Sydney for five days, travelling to and from the city to see all the main sights such as the Opera House, Sydney Harbour Bridge, and also doing the SKYWALK on Sydney Eye Tower, which involves walking on the roof of Sydneys tallest tower. As well as the SKYWALK we spent an afternoon on a cruise around the harbour, stopping at all the main sights. As well as staying in the city, we visited the famous Bondi Beach and visited an old school friend who showed me all the nontouristy areas of Sydney, which was amazing! Melbourne – After another overnight bus we sadly reached the final stop on our East Coast trip. With only one week left in Oz, Melbourne was my final place to visit and explore. It safe to say that if I’d not gone to study abroad in Brisbane, I would definitely loved to have lived in Melbourne! I see Melbourne as a bigger version of Brisbane, apart from the bad weather in Melbourne. Before I came to Australia, I was well warned that if I was coming to Oz for the weather, do not live in Melbourne. Unlike Brisbane, where it is almost a constant summer, you have to prepare for four seasons in one day in Melbourne, even in summer! Nevertheless, Melbourne is a great city for shopping, eating, exploring and is well known for the quirky street art that changes daily. 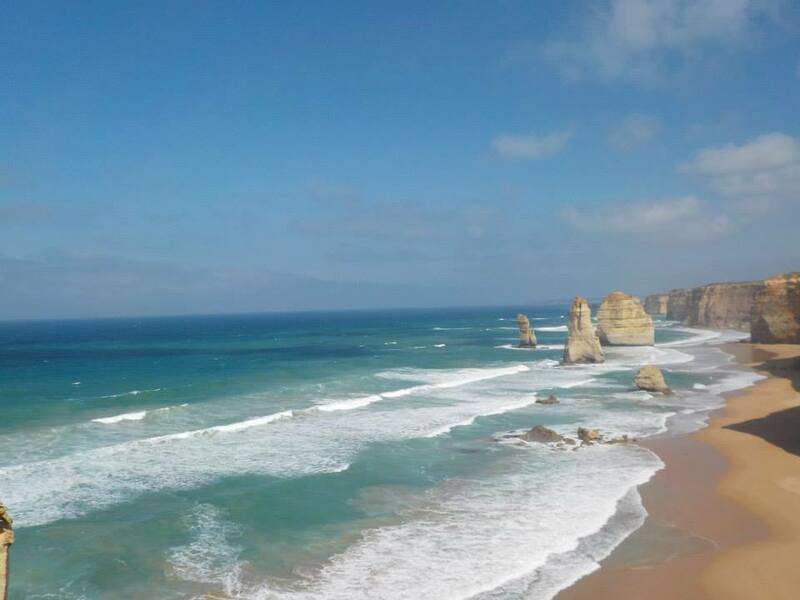 The Great Ocean Road – The Great Ocean Road is an expanse of ocean road driving on the coast of Victoria, famous for its limestone rock sculptures along the whole coast. 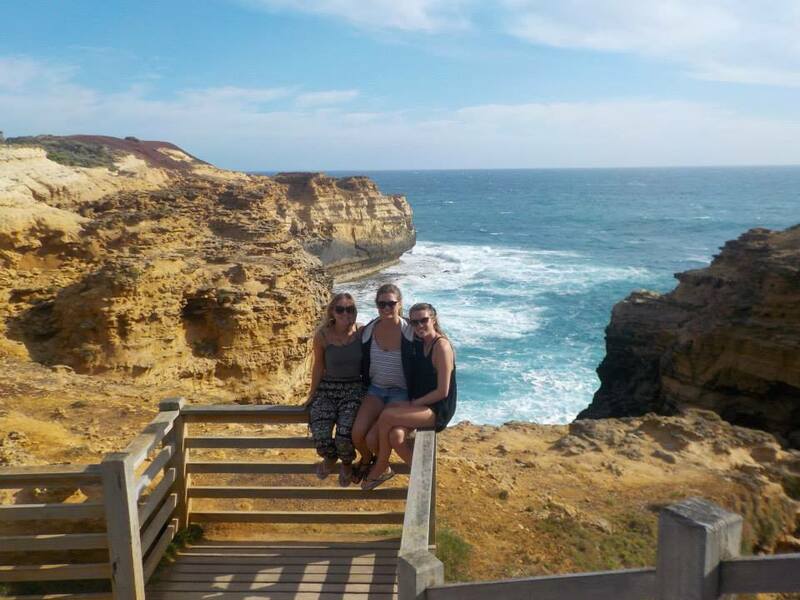 The trip was completed over two days, stopping off at multiple bays, beaches and visiting the famous Twelve Apostles at sunset. How’s things now in Manchester? It is time for the concluding entry of this blog, as reading week has arrived and it is time to assess how a reverse culture shock might have manifested itself, as well as how re-integrating into Manchester has evolved. As winter is approaching, with every leaf that hits the ground I realise more and more that missing out on winter in Australia has had quite an impact on me. Probably, of all adjustments to Manchester, weather and the tempo changes have been the most pronounced. In Australia, most of the activities occurred outdoors; in fact, the distinction outside/inside did not really dominate thinking that much. After all, I still managed to go camping and swim in the ocean in the middle of the winter in Noosa. Now this summer I found myself starting to plan a camping trip a couple of weeks into December in the Lake District. It was only after a bleak realisation that it does actually get quite cold that I put the idea to rest along with habits of hanging out on the grass, or barbecues in the park. In that sense, if there is a reverse culture shock, then climate and weather are at the core of it. I noticed that I pay more attention to the sky and nature now than I did earlier, and really enjoy the blue skies over Manchester when the clouds clear out. I have found the cold, harsh winds and cloudy days to inherently create an atmosphere where reality is viewed as more bleak and rough, whereas the reflections of the sun in the Brisbane River and colourful birdlife made for a more idealistic, optimistic environment. It definitely constitutes a change in lifestyle. I doubt that anyone would expect the Aquatics Centre to have a permanent outdoors pool here. Also, in terms of wildlife, the diversity of subtropical Brisbane and the antennaed, shelled, auburn cohabitants have given way to squirrels hoarding their goods, ravens, and the default city-creatures, doves. These disparities manifest themselves in conversations with friends in Australia who tell of a kaleidoscopic spring dominated by purple-blue Jacaranda trees blooming, 40 degrees outside and sunshine in full effect. The speed of life has similarly undergone a subtle change. Obviously, I am in my final year and have quite a few extracurricular obligations, yet I have noticed the Manchester environment, the city-space, contribute to a perception of it being further accelerated. The way I see it, the wide roads, large space, infinite blue sky, the distance of the campus from the hustle and bustle of the city, and the large green areas in the city and on the UQ campus all help approach life from a calmer viewpoint. However, the noisy, crowded Oxford Road corridor at the heart of the University in Manchester creates a restless urban background-scenery, a relentless space of busyness. Seated among the trees of Whitworth Park, one still can hear the buses spit out smoke with every take-off. At lunchtime at UQ, unsurprisingly, most people gathered at an amphitheatre shaped park to the sound of the water fountain and songbirds. In terms of interactions with people, I feel that rather than undergoing a cultural shock, drops have been added to the culturally fluid state that makes up my identity, with roots and branches in a wide variety of spaces and connecting to a variety of persons. That also means that, whereas I definitely feel a changed person, the transition to Manchester has been seamless. Arguably, I even appreciate the opportunities that Manchester offers more now. In particular, I am referring to enhanced dedication to the basketball team, starting a society – Struggle for Recognition: Indigenous Peoples’ Rights, and working with refugees. Thus, with only one year to stay in Manchester, I would not speak of a reverse culture shock, but of a cultural spark; especially in terms of me seeking out new experiences and trips in the Northwest as a consequence of the perceived freedom of movement in Australia, as well as in terms of transposing the energy, invigoration and motivation of Australia to a demanding year in Manchester. I carry a part of Brisbane, Australia in me, like I do parts of Manchester, UK, wherever I go. All in all, life in Australia has further galvanised a spirit of exploration expressed in freely, capriciously firing cultural sparks that I have since built upon in Manchester. By Karl Vikat (University of Queensland, Brisbane, Australia). As my time in Brisbane drew to its close, the speed of life kept gaining momentum. The last couple of months were particularly intense, filled with exams and essays, fitting in travelling, discovering the hitherto uncharted parts of Brisbane and spending a maximum amount of time with people I cherish and whom I knew I had to leave in the near future. I appreciated every single second. Bizarre realisations of living the moment, yet knowing its fugacity and its inescapable turn to memory emerged during more quiet moments. 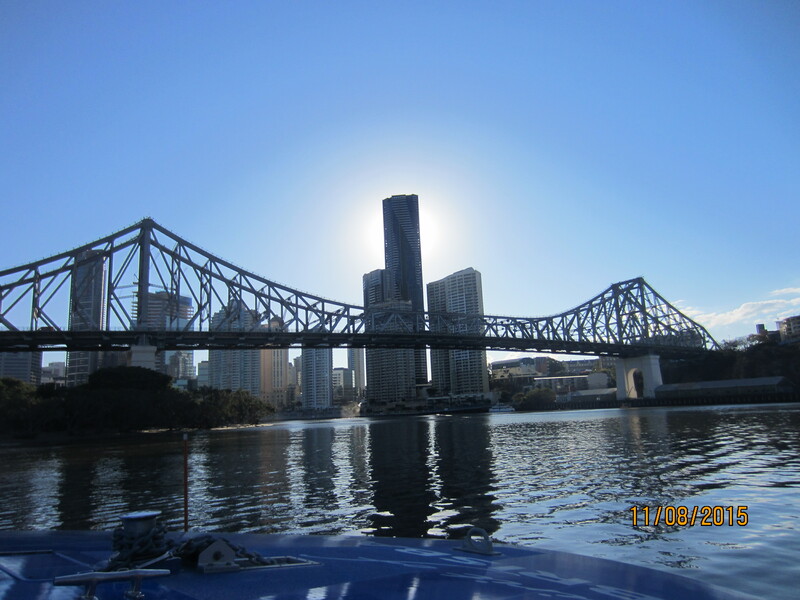 No clichés here; studying in Brisbane was, hands-down, an incredible, thought-provoking, life-changing experience. The beautiful moments lived with great people provide ample material for further meditations. 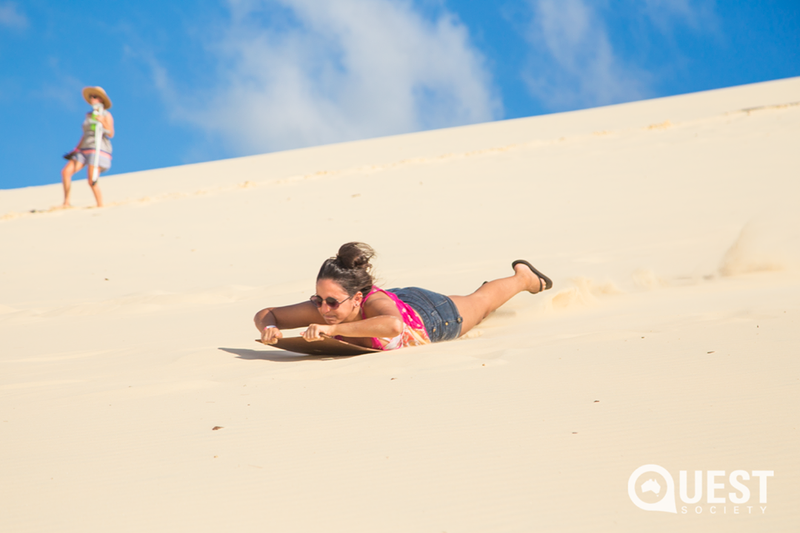 From road tripping to doofs, to more conventional bus trips to some of the world’s most ancient rainforests; from Dingos on Fraser Island snooping around your sunset snack, to cassowary stories in the Daintree and wild kangaroos well over 2 metres peacefully nibbling on grass and greeting you on your way to the beach. The wide range of episodes and colourful people provide awesome memories. 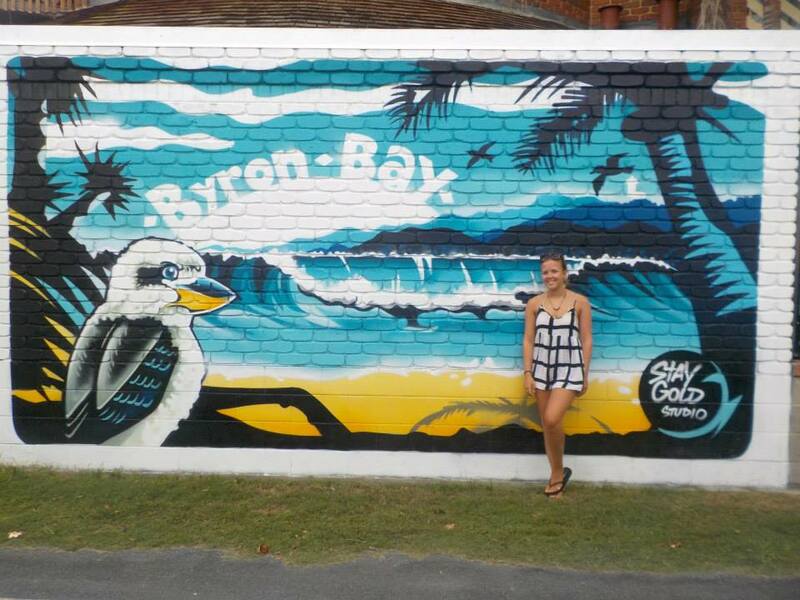 A short pre-exam trip to Byron Bay, that turned out to be quite a sleepy town during the week, introduced me fully to the intricacies of geocaching – a kind of real life GPS Easter egg hunt. Part of the ubiquitous marvels of nature that abound in that corner of Australia, was one of Australia’s top dive sites that lies just a couple hundred metres off the coast of Byron, at Julian Rocks. We were only too keen to get out there, and rightly so, as we were greeted by colonies of Wobbiegongs, a few loggerhead turtles and a kaleidoscope of fish. I had two standard exams and one take-home exam that proved to be a great alternative to a more conventional exam configuration. It basically worked the same way an essay does. I received the questions on Monday, the deadline was on Thursday, as all the while exams were happening simultaneously. 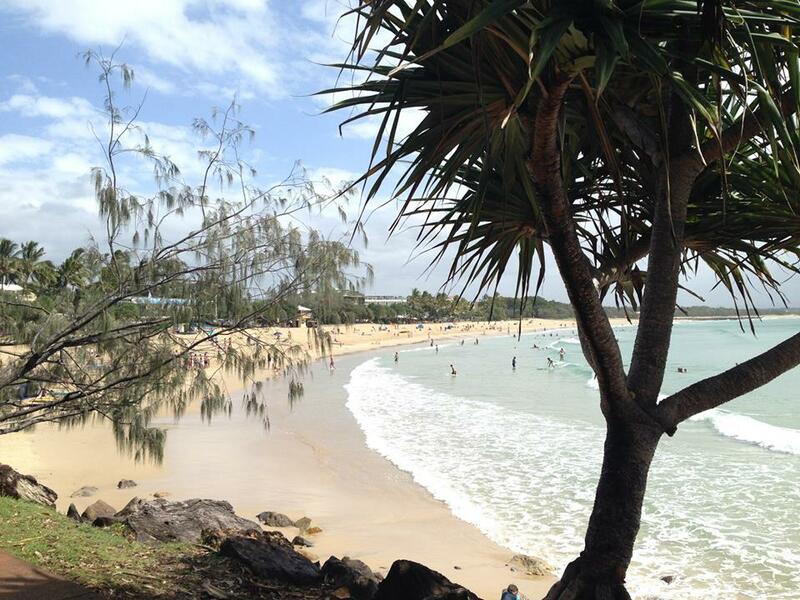 Once exam time was behind me, I left Brisbane for camping at Noosa Heads. We managed to catch some sunshine, a few waves, and, once we set foot in the city, some great Malaysian food. It turned out that the nights get pretty cool come June-July, so we decided that our next stops after Fraser should be a few hundred miles further up north. We returned to Brisbane for a day, to re-pack and catch a flight to Cairns. On the day of the flight though, a couple of hours before, I took it upon myself to move out. I had no use for my room in Brisbane any longer, since I would leave Australia, coming straight off the east coast trip. So I brought all my stuff over to my girlfriend’s place after she had helped me clean the place and packed my stuff, with the always generous landlord’s wife driving. So, in a well-organised hurry, about 2 hours later we were on the plane on our way up north, towards the Reef and Cape Tribulation. Considering the way politics has been going the last 30 something years, allowing for destruction of up to 40% of the reef, the priority the government gives to the expansion of pre-existing coal ports as opposed to reef protection, and the pressures exerted by climate change, I had conflicting thoughts of our visit to the Reef. It was bizarre to marvel at the splendour of its rich marine life and its diverse manifestations and colourful expressions, and know at the same time that this very spot might be dead bleach in a couple of years to come. The ecosystems obviously were very much alive and showing off their vitality with vigour, yet, we also heard from the crew that some places they had headed for in previous years would need some time and support for regeneration. Ostensibly though, boats and unexperienced divers kicking coral do not quite compare to the larger aforementioned threat. Returning to the city, Cairns seemed a lot more like the countryside than Brisbane with its large roads, even larger cars and surrounded by mountains of untouched rainforest. This seemed to be the frontier, the stop before heading out on the dirt roads to Cape York. No passing through without a four-wheel drive, if you want to head up the track north of Port Douglas and Cape Tribulation. Back from Cairns and Daintree, I spent one more night in Brisbane and headed for the airport the next day, spontaneously closing my bank account on my way. I had actually planned to pay the taxi driver with coins, yet he preferred the paper version and it turned out that over 100AUD in round metal pieces had accumulated in my ‘coin-bag’ over the time – a very welcome surprise. 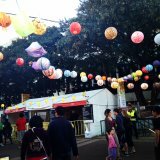 Brisbane did not only invigorate me with a new-found love for markets with its Greek-themed fairs, noodle-markets, the West End market and colourful East-Street market, where I fully endorsed the indispensability of a poncho. I made friends from across the world, got some insights into new languages thanks to embracing the proximity to Asia, and, all in all, just got to live, see and learn about a previously unfamiliar land and its people. It left me with a hunger for more and a motivation to study harder to keep rewarding myself with experiences of a lifetime. The intensity of the moments that I lived, created a desire to keep hold of my principles and philosophies that were moulded and developed also during my sojourn in Australia. Amongst others these included continuing saving material as well as non-material resources that can be made available for travelling. I feel like I learned so much. Also, the courses at UQ and the discussions with students were in many cases inspirational, helped me chart my future academic and career plans by defining my interests further, and offered me a wide range of new perspectives where to draw from and relate to. It was an amazing, time that was energising to its core. By Serena Graham (University of Queensland, Brisbane, Australia). After all the waiting and anticipation I’m finally in Australia! I probably should have written this sooner but I’ve been so busy since I’ve been here, so here’s a recap of everything that’s happened so far. My journey here consisted of 3 parts: Birmingham to Dubai, Dubai to Singapore, and Singapore to Brisbane. In total it took over 24 hours to get here and I am thankful that I won’t have to do this journey again for a whole year! It was very tiring and since I was travelling alone it seemed to last days. Luckily, the in-flight entertainment was pretty good so I was able to watch a few films to distract myself from the turbulence. For anyone who’s planning to visit Dubai airport: it is massive! I spent about 2 hours circling round the airport trying to find my departure gate, only to find out I actually had to get a train to the other side of the airport! On the last plane of my journey I happened to be sat next to two other exchange students so I made some friends before even arriving. When I finally got to Brisbane airport, I had to wait another couple of hours because there was not enough room in the transfer bus for everyone to fit in. Luckily my mum had paid for me to stay in a hotel for my first two nights here so I had the chance to catch up on all the sleep I had missed. I then moved into a YHA hostel which was where a few other students from Manchester were staying. As far as hostels go it was pretty good – very clean, safe and the staff were extremely friendly and helpful. They even had a pool, although it was far too cold to use. I was sharing a room with 3 other girls, so it was quite hard to get some sleep (I’m pretty sure one of them was sleepwalking in the middle of the night!). After meeting up with other UoM students, we went house hunting together. We loved the first house we viewed and moved in a couple days later. Unfortunately we had somehow failed to notice the various holes in the ceilings/walls and didn’t even acknowledge the fact that there was no oven! The house is in an ideal location, it’s a student area just minutes away from Indooroopilly shopping centre (I’m still unsure how to pronounce it- many of the towns in Brisbane originate from Australian Aboriginal language e.g. Toowong, Woolloongabba, Mount Coot-tha). Once we had settled into our house, we decided to go to the Koala Sanctuary which isn’t far from where we live. I would definitely recommend going there; it had a wide range of animals, from lizards and snakes to wombats and kangaroos. I got to cuddle a koala and managed to get a selfie with a kangaroo! We also visited Southbank, which is a beautiful place by the river, within walking distance from the city centre. 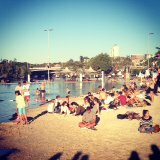 There are various food and clothes markets there at weekends and a great little man-made beach. Some advice for anyone planning to visit Australia: you will probably be warned about the ‘drop bears’. They look similar to koalas but are extremely dangerous and tend to attack by dropping down onto their victim from trees, targeting foreigners in particular. Don’t be as gullible as I was – they are completely fictitious and this is a common prank Australians play on tourists to scare them! You got to know a little bit about my travels and enough time has passed now to cast some light on the academic side of university life. As in Manchester, I have been able to organise my week in a way so that I got lectures and tutorials Monday to Wednesday, with the rest of the week off for independent study. Therefore, Monday is especially packed, as tutorials here are generally planned to follow the lectures immediately. This makes it more convenient, in the way that you’ll necessarily be doing your readings for the lectures already, come more prepared, and won’t be able to wait for the ‘tuts’ to come around. Yet, this also entails that days with two blocks of lectures can get pretty tiresome towards the end of the 6 hours. The lectures tend to be more interactive at UQ, as lecturers encourage discussions and allow them to go on for a substantial amount of time, with the lecture essentially turning into a seminar. However, the more ‘classical’ IR, security lectures follow less this discursive approach. Some lecture recordings are made available only after all lectures have been completed. Since the powerpoint slides are seldom packed with information, the course convenors that apply this tactic obviously encourage more people to come. Although this can be annoying if it clashes with other obligations, I have found it to be a better solution than simply creating an audio/visual companion that incentivises absenteeism and renders a lecture theatre virtually redundant. For that purpose, some courses at UQ have the option of ‘external’ courses, where the lecture material becomes available immediately and tutorials are replaced by short analyses of key texts. A number of my courses have also had guest lecturers come in from either Griffith University (another uni in Brisbane), or have had politically engaged academics present specific issues. Immensely more convenient than in Manchester is the submission of assignments, as no hard copy submission is required, and Turnitin alone does the trick already. Also, taking a nap outside on the greenery is a much more realistic option than in Manchester. Whereas late autumn brings cold winds, mud and freezing temperatures in the Northwest, Brisbane’s mild climate allows you to leisurely lay on one of the many green pitches, still now in May. When it comes to the workload, then Manchester has the advantage over UQ, as every course has an additional assignment, beyond the essay, tutorial and exam mark. This means that, although I did not have mid-terms, I was writing on the extra assignments, instead of preparing for the major essays. Managing that with the extra assignment I still had from Manchester made for quite an intense week and a half. Next up are essays, every week from the end of April to the first week of June. Worth mentioning is also the weekly movie screenings put on by the POLSIS (Politics&InternationalStudies) department, where a faculty member presents a certain movie, followed by a little discussion/analysis session later on. Compared to Manchester, these events are more regular and enjoy a greater attendance and arguably more enthused viewership. In one case, we even had the opportunity to skype with the director afterwards. On other occasions, researchers have been able to share their expertise on the context of the issues treated in the films. Getting to class is easy, just a 5 minute bus ride away, and the campus is very well connected with two main bus stops catering to the Western, and Eastern suburbs respectively. The spaciousness of Australia also allows for more breathing room in the city, as houses are larger and less squeezed than in the UK. Well after all, Australia ranks 235th compared to the UK’s 53rd place in population density. The University campus houses a plethora of coffee shops, a smoothie bar, Pizza café, bar, food court and even a cinema. On another note, what squirrels are to Manchester campus, big yellow lizards, i.e. Eastern Water Dragons are to UQ. Doves are replaced by large ibises and Noisy miners, who sneak up whenever you’re putting on your best cookie monster impersonation, also apparently another campus even hosts a wild koala.